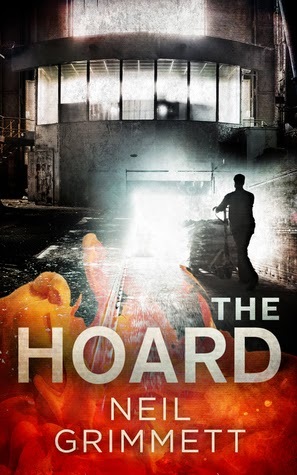 The Hoard is a thriller set in the secretive, dangerous world of a Royal Ordnance Factory; a vast, surreal place full of some of the most volatile elements on the planet. Thirty years before the main story, the nitration house at the ROF in Bridgwater exploded in a fireball that could be seen for miles around. The entire crew was killed, and the source of the explosion was never found; authorities claimed that the charge in the nitrator had gone critical and that the chargehand was unable to stop a lethal cook-off. But Gunner Wade, the man the nitration crew sent for help that day knows differently: they were murdered; and he was branded a coward. Now Byron, the son of one of the victims, enters the sprawling Gormenghast-like compound of the top secret factory to discover the truth about his father's death. But what he finds in the dark heart of this world is a hidden hoard of super-high explosives; illegally produced and drenched in the blood of those killed to conceal its existence. As the threat of discovery mounts, Byron finds himself at the centre of a struggle between good and evil; both to prevent a destructive force from being unleashed again and to bring the sadistic mass murderers who killed his father to justice. He is aided by an unlikely alliance of helpers, including the beautiful widow of a murdered chemist and Gunner Wade. Against them are the original perpetrators and their new legion of evil acolytes. Inspired by a massive explosion that killed six men at the real-world ROF Bridgwater facility in 1951 - no cause was ever found - The Hoard is a gripping, grim novel that offers a glimpse into a self-contained apocalyptic landscape scarred both by the birthing of the materiel that fuels war, and the hearts of evil men who would do anything for greed. If you are looking for a book that is dark, and full of people you can’t trust then this might be the book for you. This book starts out in 1951 where we find a factory that is in definite trouble. There are secrets within and they are secrets worth killing for. Fast forward to the 1970s where we meet the son of one of the victims. At the time of his father’s death he was unborn. Now he has gone to work for the very factory that took his father’s life. He needs to know why his father died. Unfortunately there are still those who don’t want anyone to find that information and once again they are willing to do whatever it takes to keep those secrets hidden. This is not one of those books you quickly skim through and move on to the next. This book is full of deeply drawn characters. The author has made sure that by the end of the book you know them well. The idea that it is based on an actual factory accident made it all the more interesting to me. Like I said. If you like the dark side of things then this is definitely the book for you. This is highly recommended for anyone who loves deep, dark thrillers. I enjoyed this one much more than the threshing circle. When asked if I would be interested in reading it, the thing that clinched it for me was being told that it was much darker than the first one. This is something that I love in a thriller.